Easy spicy Papaya salad(vegan, vegetarian). A simpler version of the ever popular Thai Papaya salad for you to make at home. all the ingredients come together with a few pounding of the mortar and pestle. I thoroughly enjoyed making this beautiful salad. It’s not only just pleasing to look at but an easy, tasty salad to make. Although a more simpler version of the popular Thai Papaya salad, I should mention that this is quite a super spicy dish. It’s somewhat similar to what we Sri Lankans call an “achaaru“, no, not pickles as you would assume but a very satisfying mix of raw Mangoes, Pineapple, olives mixed in a spicy paste of chilli, salt and Sugar. It was what we ate when the craving for something sour and spicy hits us in the middle of the day and a street food found in most areas where a crowd gathers. So the Papaya salad is something similar to this only you can serve it at meals as well. 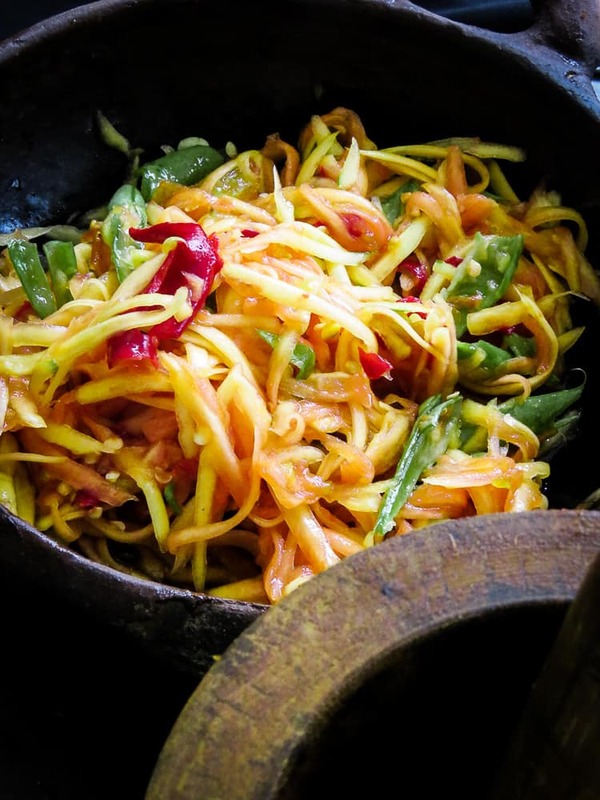 I should mention that this recipe is not the Authentic version of the Papaya salad, there are a few ingredients missing, hence the mention of the salad being a”simpler”version, similar to the Cashew curry I did yesterday. In salads like this, seasoning is important, since the taste of this dish is really spicy with a bit of sweetness coming through, make sure you are constantly checking if the taste is balanced. For more recipes like this Easy spicy Papaya salad(vegan, vegetarian) . Remember to subscribe to islandsmile food blog and get your fix and helpful recipes for your family delivered to your inbox. You can also find and follow me on Facebook, Twitter, Instagram and Pinterest. 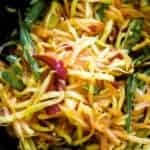 This Papaya salad is best served fresh, which means just having the Papaya shredded and then pounding and mixing in all the ingredients 15-20 minutes before serving. you can garnish with a tablespoon of coarsely crushed peanuts for extra crunch. 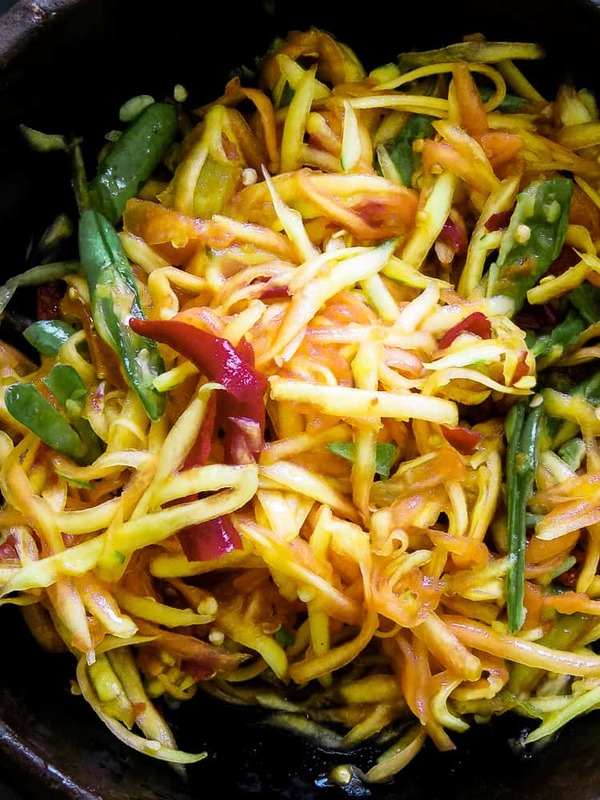 Recipe- Easy spicy Papaya salad(vegan, vegetarian). Papaya tends to ripen fast in warm weather, especially here, left too long they become too ripe to shred. even the Papaya I used for this post was slightly ripe but I decided to use as I was able to shred them without the slivers becoming mushy. use a Papaya with dark green skin and firm when pressed. Since I was serving this salad for kids, I decided to leave out the shrimp paste which has a strong aroma that they wouldn’t have liked. personally, for me its one of the bestalthough spicy, everyone liked everything about this dish from texture, to the taste, even the left over dressing left after the bowl was empty found a happy tummy to settle in. How to shred Green Papaya. Peel the skin of the Papaya, Halve the fruit, take out the seeds, using a grater, shred long, fine thin slivers(preferably long ones). although there are a few methods to do this, I find this is the easiest. 2 cups(1 fruit) of shredded raw papaya( see above for directions). In a small bowl, mix lime juice, fish sauce and Sugar, taste to make sure the three ingredients are balanced in flavor and set aside. Place the Garlic cloves in a mortar, pound until they are crushed. Add the chillies and pound them until they are coarsely crushed. Include the Beans and pound until they are slightly bruised. Add the shredded papaya and pound lightly so as not to make a pulp but to incorporate the other ingredients, if you are using a small mortar, the papaya can be done in small portions. the pounding should be kept to a minimum and less than a minute. Transfer the ingredients from the mortar into a large bowl, pour in the dressing of lime juice, fish sauce and sugar to the shredded Papaya and toss well. Taste to check if the flavors are balanced. 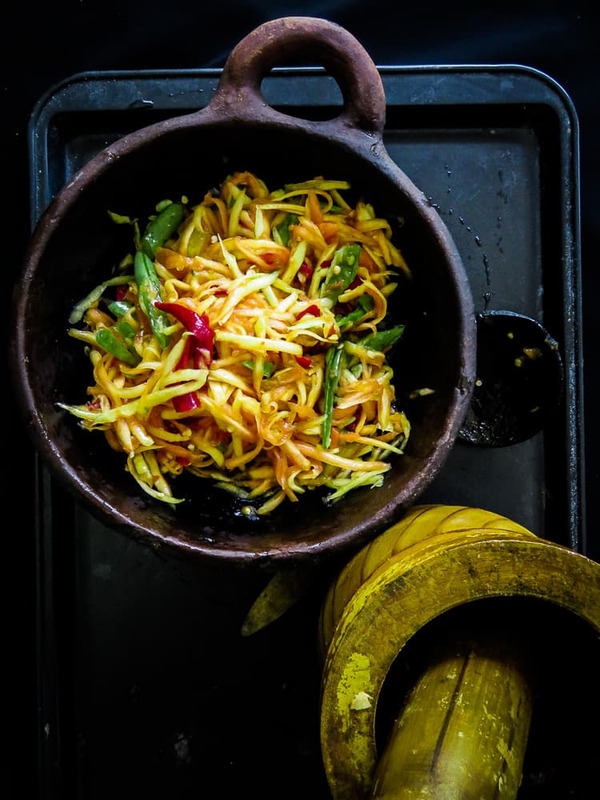 A simple version of the ever popular Thai Papaya salad for you to make at home. all the ingredients come together with a few pounding of the mortar and pestle. How to shred Green Papaya?